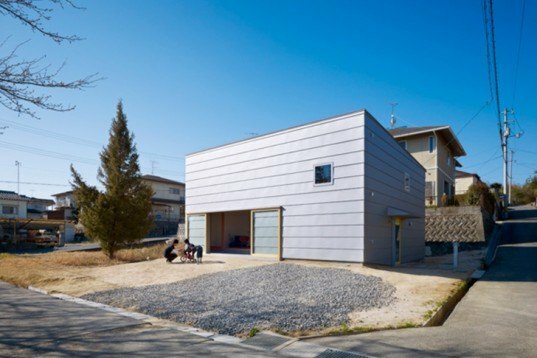 This quirky house in Hiroshima, Japan, features a polished modern exterior - but walk inside and you'll find a traditional tamped earth floor! Designed by up and coming Japanese architect Makoto Tanijiri from Suppose Office, Takaya House is made from natural local materials found in the area. Read on for a closer look at this clever eco-friendly home's charming earthen interior! Suppose Office designed this Japanese family home with big sliding walls and windows, simple materials and a traditional “douma”, or earthen floor. Its exterior is clad with grey wooden boards and its interiors are filled with rustic materials, sparse furniture and open spaces. Its sliding doors and floor-to-ceiling windows allow the family to adapt the space to their changing needs. Lots of wood, white surfaces and multiple levels provide the house with a flexible atmosphere that makes life flow easily. The traditional earthen floor has plenty of advantages: it is affordable, made of local materials, cool in the summer, warm in the winter and it is so easy to install that can be done with the help of kids. The Takaya House is yet another example of how Japanese architecture brings the outside in, and it’s a beautiful example of how we can live well, and closer to nature. 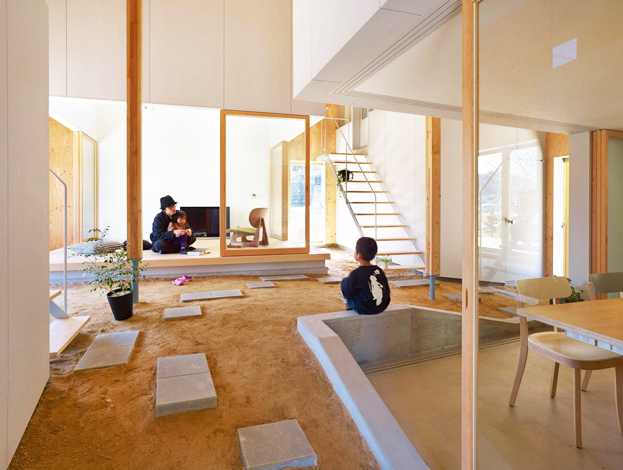 Suppose Office designed this Japanese family home with big sliding walls and windows, simple materials and a traditional “douma”, or earthen floor. Its exterior is clad with grey wooden boards and its interiors are filled with rustic materials, sparse furniture and open spaces. Its sliding doors and floor-to-ceiling windows allow the family to adapt the space to their changing needs. Lots of wood, white surfaces and multiple levels provide the house with a flexible atmosphere that makes life flow easily. The traditional earthen floor has plenty of advantages: it is affordable, made of local materials, cool in the summer, warm in the winter and it is so easy to install that can be done with the help of kids. The Takaya House is yet another example of how Japanese architecture brings the outside in, and it's a beautiful example of how we can live well, and closer to nature.